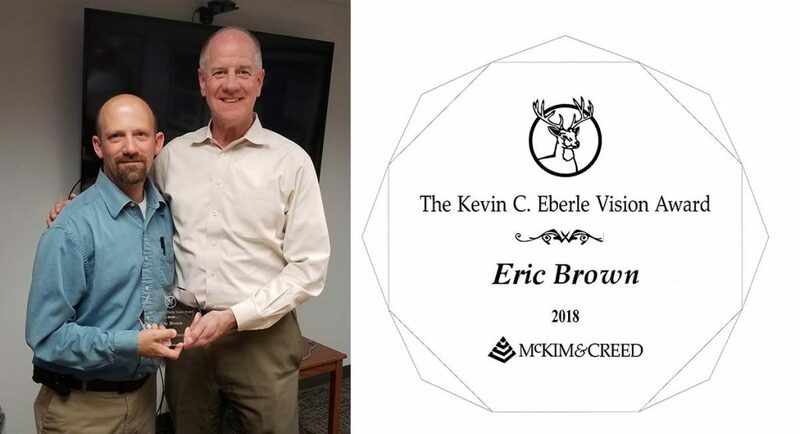 Eric Brown, an instrumentation & control technical specialist in our Clearwater office, has won McKim & Creed’s 2018 Kevin C. Eberle Vision Award. The award was presented to Eric on January 31, 2019 by McKim & Creed President and CEO, John Lucey. The award was created as a tribute to McKim & Creed Project Manager Kevin C. Eberle, whose unrelenting willingness to help others personified our company vision of “people helping people.” After his untimely death in 2012, McKim & Creed created the Kevin C. Eberle Vision Award to recognize employees who truly exemplify a spirit of service and sacrifice for the benefit and advancement of others. It is awarded annually to an employee who has demonstrated extraordinary efforts to help others achieve their goals and dreams over the last year or more, demonstrating the spirit of “people helping people.” Winners are nominated by one or more of their coworkers. 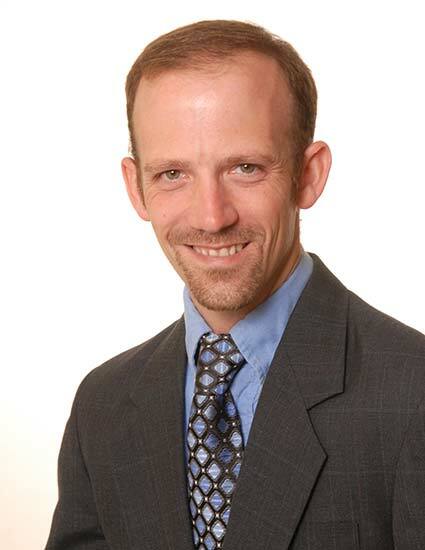 This year’s winner, Eric Brown, joined McKim & Creed in 2002 as an instrumentation specialist. He was one of the first members of McKim & Creed’s instrumentation and controls (I&C) group. Eric has been called “the poster person for striving for continued education and attaining personal goals through challenging times.” He had a technical degree when he joined McKim & Creed, and attended classes at night and on weekends to earn a degree in general studies from St. Petersburg College in 2005. Then in 2006, he enrolled in McKim & Creed’s tuition reimbursement program. Six years later, Eric graduated from the University of South Florida with a degree in electrical engineering. Again, he attended classes at night and on weekends so he could work full time and spend quality time with his family. Eric helps everyone, and I do mean everyone. Eric’s dedication to our clients is a huge reason for our success. He has a great reputation among all our clients due to his relentless responsiveness and technical ability to work on many types of systems. He catches and releases small gecko lizards that get into the office so employees that are freaked out by them can work without fear. His dedication, attitude and approach to work are contagious and make everyone around him a better person. He enjoys success but equally enjoys seeing others succeed and will be there for you whenever he is needed be it colleagues, clients, family or acquaintances. And wasn’t that what Kevin was all about? I considered Kevin Eberle a friend and colleague for whom I had great respect. And the person I know that comes closest to the mindset and personality of Kevin is Eric Brown in the Clearwater office. He is constantly challenging our group to get better, try new things and expand into services that help differentiate ourselves from our competition. On my first day of work at McKim & Creed nearly 13 years ago, I was greeted at the door by Eric, who let me know how happy he was to have me there and that I was the perfect addition to the group. He led me around the office for introductions and helped me to understand the details and nuances of the company and in every way, made sure I was prepared and able to do my job. Eric may be the most technically competent person in his field that I have worked with. Clients continue to return again and again for new projects and know that Eric has their best interests in mind when he makes recommendations or plans their systems. Contractors recognize Eric as someone who will work to deliver a quality product and expect them to live up to their contractual requirements. Vendors see him as someone who knows as much or more about the product than they do and often reference him as an expert with their equipment. He is often my first call because he usually answers regardless of physical location, time and workload. He made himself available as a resource to me throughout my fieldwork even though it was not his responsibility. He is very easy to work with has a good outlook on situations and has been an absolute pleasure for me to work with. Congratulations to Eric on being selected by his coworkers as McKim & Creed’s 2018 Kevin C. Eberle Vision Award winner.